Beautifully restored character cottage Le Fournil, stunning panoramic views of the Pyrenees, 10x5m pool, self contained high quality Gite for 2 - 4, all Mod Cons, free WiFi Internet. Tastefully appointed rooms that invite to relax. Tranquil retreat for a couple, but also a lovely spacious holiday home for a small family or two couples. Easy access to Toulouse and Tarbes Lourdes airports, Spain only 45 minutes away. Beautiful rural and peaceful location, ideal for cycling, walking, all outdoors activities, bird watching, star gazing or just for a relaxing holiday. Le Fournil is a self contained cottage, full of character, its name reflecting its agricultural past, when it was the bakehouse and grain store to the main house Le Couloumé, built around 1850. We have lovingly transformed Le Fournil into a spacious self catering holiday cottage and Gite with all Mod Cons, including WiFi internet, whilst retaining most of the original features, with exposed beams in the bedrooms and the old bread oven still in place in the sitting room. Le Couloumé is a traditional French farmhouse with several outbuildings sitting in over an hectare of land on a south facing slope in a commanding position in Loudet, a pretty village in a range of hills sometimes known as the Little Pyrenees, in the Haute Garonne region, just on the border to the Hautes Pyrenees. Large 10 x 5 metre inground pool with stunning mountain views, paved beach area with plenty of sun loungers, two big parasols and solar shower - a gorgeous suntrap! Pool is shared with guests in our B&B. Geographically we are in the Central Pyrenees, almost equidistance between the Atlantic and the Mediterranean coast. Nestling in an ideal position we have access to some of the most beautiful scenery that France has to offer. From lovely rolling hills, through to the World famous Tour de France Pyrenean Cols, like the Col de Tourmalet. We enjoy magical uninterrupted views of the Pyrenees across the valley - in fact we can see the mountains of three different departments, the Ariège in the east, the Haute Garonne in the south and the Hautes Pyrenees to the west, and even Spain! Make your holidays with us extra special by booking one of the guided mountain and nature tours that we offer in partnership with a local qualified mountain guide. Take a day of hiking and wildlife spotting in the high mountains or an adventurous afternoon of wild river walking or come in winter for a snowshoeing tour, then relax with a freshly prepared, locally sourced picnic lunch, set in the unspoilt wilderness! Personal guided walks, wild river walking and wildlife experiences for all seasons, with options for groups or private tailormade family trips (children starting from 6 years), all at reasonable prices including equipment and lunch, you can have a truly unforgettable experience! Our location in the Central Pyrenees is also ideal for house hunting and exploring the area, and we would be happy to share our experiences with you, recommend estate agents etc., contact us for longer lets in the low season. We are Brian and Marianne, your hosts at Le Couloumé and Le Fournil, our beautifully refurbished Chambre d'Hotes and gite. In 2011 we decided to make a dream reality: quit the stresses of commuting to London and start a new life in the French Pyrenees. Now you can share our dream and spend some time in this wonderful part of France with its stunning panoramas and rich history. Brian is a passionate cyclist and found a cyclist's nirvana here. He also brews a variety of beers of excellent quality, as anyone who tries them will attest. I am a Berliner by birth, with an inborn wanderlust, and a natural linguist speaking three and a half languages: German, English, French and a bit of Spanish. I also enjoy cooking vegetarian meals, with many ingredients coming from our potager, the typical French kitchen garden, where we grow a lot of our own fruit and vegetables. Our dogs Monty and little Maddie are both rescues from a local dog refuge where I am doing volunteer work each week. Monty is around 3 years old, very friendly and he seems to love everybody especially when people make a fuss about him. He's also very good and gentle with children. Maddie is only 1 year old, much smaller than Monty, very nice natured and she enjoys playing with Monty and with children. We love our new life here and look forward to introducing this region to you. The grandeur of the mountains; the magnificent rivers and lakes; the beautiful, ever-changing landscape; the stunningly dark night skies with their canopy of luminous stars; the neat villages and the friendliness of the people totally won us over. The departmental capitals of Toulouse, Pau and Auch - rich in shopping and cultural attractions - are all within 1 hours drive by car; or by train from Montréjeau, just 8 miles down the road. Toulouse is well served by international airlines like BA, FlyBe, Easyjet and Ryanair from UK airports; Ryanair also flies to Lourdes Tarbes airpory from Stansted. We searched a long time for a property which would tick all our boxes and found the perfect place in Loudet. Close by you will find activities of all kinds; extreme sports; leisurely sports; wine festivals; country fairs; music festivals; pre-historic cave paintings; Roman villas and a history rich in drama, romance and tragedy. At first sight Le Couloumé seems modest; but drive through the huge wooden portal and prepare to have your breath taken away. The stunning view of the mountains is superb (unless it happens to be raining - which, sadly, can happen!). You have left your world behind and joined our world for instant relaxation. The character of the house and lovingly-renovated cottage will charm you. The beautiful setting can be enjoyed from your patio or from the garden. The mountains stretching from east to west seem so close you can almost touch them from the patio at Le Fournil. Totally private and secluded if you want to be; but open to the wide spaces, the pure, clean air, the birdsong and the high skies of deep France you will be perfectly situated to explore everything the Pyrenees have to offer. Modern bathroom equipped with fully tiled shower unit, wc, bidet, sink and towel radiator, a hairdryer is also supplied. All towels provided, including beach towels for the pool. Enjoy the magnificent panorama of the mountains whilst swimming or from the comfort of a sunlounger on the large southfacing sun terrace. Pool is only shared with guests in our B&B (4 people max.). Notes on accommodation: Please note that smoking is not allowed, we also cannot accept pets. Secure parking in our huge barn, we also offer secure storage for bikes. Bike hire available from a local company. Outside: The cottage kitchen has two sets of patio doors, one facing west towards our garden/courtyard with lovely views, and another leading onto a big covered patio, private and south facing with panoramic views of the Pyrenees. Table and chairs provided for outdoors dining, as well as sun loungers and BBQ. Access to private cottage garden from the lounge via back door. Guests are welcome to use seating areas in our own garden as well, south facing with spectacular views of the Pyrenees. Take a seat under the walnut tree and enjoy the view of the Pic du Midi, while away the hours on the sun terrace by the pool or lay in the hammock with a book, in the shade that our big Catalpa trees provide on hot days. Cleaning / Towels / Linen / Maid service: Our rates include all bed linen, towels, beach towels for the pool, tea towels, electricity, logs for woodburner in winter, Wifi internet, Taxe de Séjour (66 cents per person per night for guests over 18 years), final clean. Towels/linen changed weekly for stays of 2 weeks or more. Perfect in every way! Great hosts and great holiday let. This gite was everything we had hoped- extremely comfortable, in an excellent,peaceful location. The whole gite is in excellent condition- very clean and well maintained. All the equipment you need is provide. The patio and pool areas have wonderful views towards the Pyrenees- we spent many hours just taking in the view - and appreciating the peaceful location. The owners have great local knowledge and are friendly and welcoming. The is so much to do in the area- walking,cycling, visiting markets. We only scratched the surface- so are so glad to be revisiting again next year. We highly recommend this gite- one of the best we have stayed in. An extremely comfortable, stylish and very well-equipped gite in a superb location. Every conceivable utensil provided, as well as many thoughtful touches. We were very impressed by the welcome tray...in particular the fresh fruit and homemade jam! Fantastic views of the Pyrenees, and the swimming pool was a bonus. Brian and Marianne are splendid hosts with a wealth of knowledge about the local area and are happy to share it! Following their advice we had a lovely walk up from the Col de Mente to the Pic de L'Escalette, which was just the sort of walk we were looking for. We also enjoyed the Roman Villa at nearby Montmaurin. Lovely walks also to be had from the property itself, especially along the delightfully shaded irrigation channel conveniently located at the bottom of the garden. Monty and Maddie, the friendly dogs, were a big hit with our two sons! We all enjoyed our stay immensely and would return without hesitation. We had a lovely week in Marianne and Brian's lovely Pyrenean Gite. The place exceeded our expectations and is the nicest Gite we have stayed in. From the first contact, communication with Marianne or Brian was prompt, clear and helpful. Marianne was particularly helpful with some recommendations for stopovers on the drive down as well - so worth tapping into their advice. The setting for the Gite was perfect for us - secluded, but with a Mairie, church and other properties nearby - so not isolated. Pool was great and was prepared for us everyday by Brian - very nice poolside equipment and parasols. 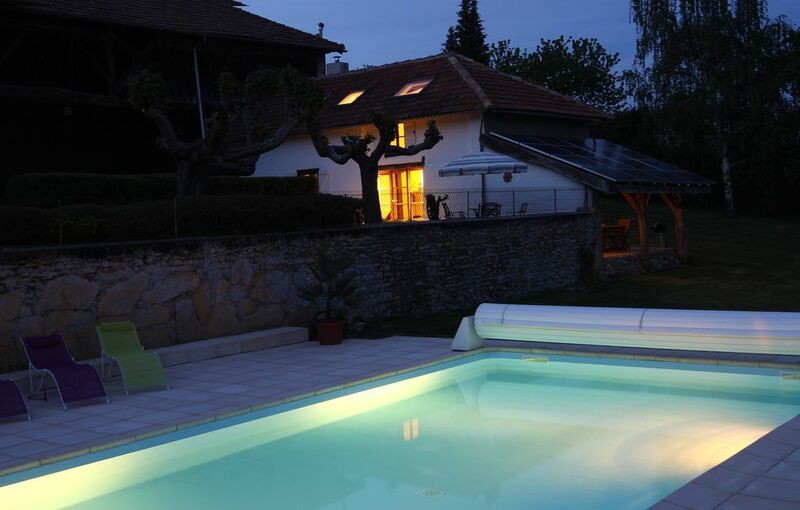 The gite itself is very spacious and cool and has been finished to a very high standard. TV set up is great - with a library of films to watch if required. Kitchen has everything we needed - everything worked perfectly and all consumables like cloths, dishwasher tablets, foil, etc were provided - perfect. The jewel in the crown is the view of the mountains and this was worth the trip alone. Really stunning and one of the really nice features of the gite is the private covered terrace which allows you to eat, drink, read and take in the view without being overlooked in any way. There is an irrigation canal running along the bottom of the property and this is ideal of shady flat walks. Marianne and Brian were very friendly and struck the perfect balance of being there to help us but also leaving us to get on with our break. Totally recommended - you won't be disappointed! We had seen the accommodation on the web but were happily surprised to find that it was much more than we had expected. The owners had gone to a great deal of trouble to think of everything that one would, or might, need whilst on holidays. Everything was in "as new" condition and everything actually worked (which is great to find when you have rented houses/gites all over France). The view was magnificent from the lovely garden and also from the pool. Our hosts, Marianne and Brian, were very welcoming and had all the answers to our questions regarding the area and the Pyrenees. We would love to stay there again. With being keen road cyclists ourselves, we are always happy to welcome fellow cyclists here. We can advise on some great cycling routes to some of the well known Cols of the Tour de France as well as other routes of varying terrain, we also provide some company if required. Secure bike storage in lockable workshop. Bike hire available from a local company. We can supply maps and route information, we also offer basic maintenance and repair tools. We are a 2 hrs drive from the Atlantic coast, worth a day trip to visit the elegant seaside resort of Biarritz with its grand hotels lining the seafront, and to enjoy a good lunch in one of the many restaurants. Or spend the day at St. Jean de Luz, a picturesque seaside village with a pretty centre with strong Basque influences, lovely beach. There is a basque festival in summer, with street music and a great atmosphere! Closest Mediterranean resort is Narbonne plage, 3 hours drive. Lourdes airport (45 mins by car), direct flights from London Stansted with Ryanair. Toulouse airport (a good hours drive), services from London Gatwick and Heathrow on Easyjet and BA. Pau airport 1 hr. Carcassonne and Biarritz airports 2 hrs. Due to our rural location car hire is recommended. 11-12 hour drive from Calais. We are 10 minutes from exit no. 17 of the A64 (Biarritz to Toulouse). Ferries from Plymouth or Portsmouth to Santander and Bilbao, 4-5 hours drive from there to get to us. The town of Montréjeau is ca. 10 minutes by car: two supermarkets, a variety of bakeries, shops, restaurants, tourist office, weekly market etc. Towns of St. Gaudens and Lannemezan are both 10 miles away, with more shops, restaurants and facilities on offer. Loudet is a very small village without any shops. There is a small supermarket (with bread depot), a post office and a bar just 3,5 km away in the next village, Saint Plancard. Whatever the season, you can enjoy a huge variety of activities in this part of the Pyrenees: cycling, skiing, walking, hiking, paragliding, rafting, climbing, golf, tennis, and many more. The Tour de France makes its way through the Pyrenees every year, so why not join us on the bike for some of the best cycling available in Europe, follow in the footsteps of the tour heroes to tackle some of the great Cols. There are excellent walking opportunities for all levels, some lovely walks can be done straight from our house. Our land is bordered by the Canal de Franquevielle, we have a gate leading onto a footpath running along the canal, a wonderful walk where the canal meanders through meadows, fields and forests, it would also be ideal if you fancied a morning jog. The long distance hiking trail GR86 (from Aurignac to Bagnères de Luchon, 154km) passes through LeCuing, a village ca. 2,5km from us. Lots of local walks, maps and routes provided. Canoeing, rafting and kayaking on the river Garonne. Booking Notes: 25% non-refundable deposit at time of booking, balance due 6 weeks prior to arrival. Full payment in advance for bookings less than 6 weeks before arrival. Damage/loss deposit of 200 Euro due with final payment, it will be returned to you after your departure assuming no damage is found. Bank transfer in Euro or Sterling, if in Sterling, exchange rate at the time of booking will be applied. PayPal: will incur an additional administration fee of 3.5% of the total value of your booking. Changeover Day: Changeover in main season (July & August) usually on Saturdays, however, we can be flexible on this depending on availability, please just check with us. Outside main season we accept bookings from 3 nights onwards (price pro rata) and midweek bookings. Access from 16:00 on day of arrival, please vacate cottage by 10.30am on day of departure. Notes on prices: Reserve now to avoid disappointment, summer 2019 almost fully booked, spring and autumn breaks still available. If your preferred dates in the cottage are already taken, we also offer B&B accommodation, please contact us for more details. All prices based on 2 - 4 people sharing. Our location in the Central Pyrenees is ideal for house hunting and exploring the area, and we would be happy to share our experiences with you, recommend estate agents etc., contact us for longer lets in the low season.